Here are the results after race 3 of the State Championships. The first 3 heats of the NSW State titles were held over the weekend of 25 November. As per usual, Sydney turned on 2 picture postcard days, warm and sunny weather, even if the breeze wasn’t quite as we expected. We could go on about the odd breezes this year and it might just be my memory playing tricks on me, but what we should have had were two 3rd rig Nor-Easters, with Saturday 15-20 knots and Sunday should have been black. That is what we would have got, if we started racing at 4 – 4.30. Instead, the breeze we got caused chaos in the rigging park. One of the best things about a 12 is having 4 rigs so that most days are good days. It comes with a cost though and that cost is the fact that you can lose a race in the boat park by putting in the wrong rig, and this happened to around half the fleet on both days. At about 12.30 on both days we were getting readings of about 12-17 knots, which is 2nd rig for most us. The question was what the breeze was going to be at 3… it should have been 17 knots plus, but that isn’t the way it panned out. A little over half the fleet put 3rd rigs in on Saturday, and Murray Press should take a lot of the blame for that. Form Civil made the 3rd rig decision early and for the few of us that were undecided, it was enough to put the 2nd rigs away and go with 3rd as well. The top boats and the heavy boys went 2nd rig, and it was the right call. Even us light guys should have had 2nd rigs in. It was the long course race on the Saturday and the fleet split into 2 distinct groups. Those with 2nd rig on battled it out up front. Form Civil with 3rd on started well and hung around with the top boats but was always going to lose out downhill on the long runs. Geotherm was looking great until their jib sheet fell apart, and they fell back to 3rd. Sydney Sailmakers controlled the second half of the race and won, from LCC who held on to 2nd place. Lincoln Crowne won the handicap with Chapman High Performance Sails. Those with 3rd rig on had some close battles too and a few of us managed to have a good chat between boats as we made our way up an incredibly long 2nd work from Clarke Island to Beashal. It had gone big rig by that stage. As if to taunt us, the wind kicked on the 3rd leg and was almost getting to 3rd rig for our last run down from Neilsen to the finish. It was short courses on Sunday and it was entirely predictable that the group of us who had 3rd rigs in on Saturday (and spent the day under-rigged) would make the opposite mistake on Sunday (and go out over-rigged). We all knew it was going to happen, yet we did it anyway. I think it’s fair to say that the first race on Sunday hit the sweet spot where it was either 2nd or 3rd. The top boats went 3rd rig thinking that the breeze would build, and those that were underrigged the day before went 2nd rig. Up the front of the race, more misfortune hit Geotherm, with Brett Hobson getting the course confused and heading around Shark Island down the first run instead of straight down to Clarke. A submarine also made it’s presence felt, splitting the fleet off the first work. 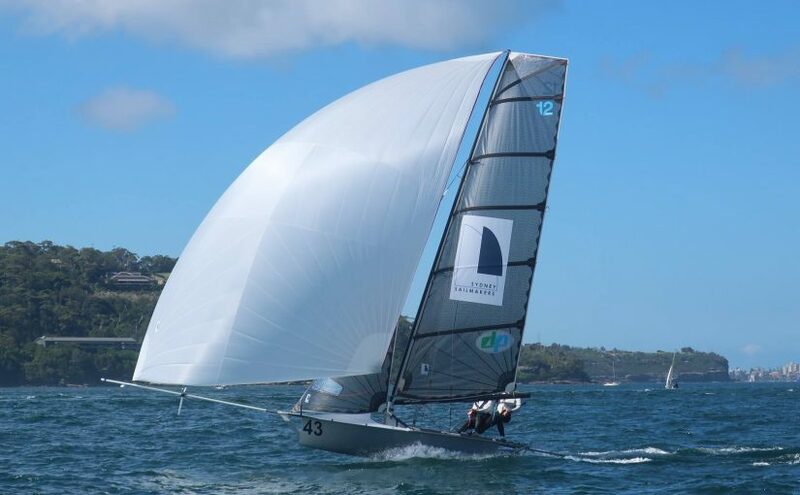 Sydney Sailmakers managed to make it 2 wins from 2 and Lincoln Crowne got second again. Terms & Conditions snatched 3rd. It had been lumpy, with strong run out tides all weekend, and it became obvious on the exceptionally nice run to the finish that the breeze was building, and 2nd rig might not be the right rig for the next race. Race 3 will live long in the memories, especially for those with 2nd rig on. It should be known as the pole breaker, as some spectacular nose dives snapped poles in half and damaged skippers. The breeze hit 20 to 22 knots, the lumps got lumpier. The 3rd rigs went inside-out upwind and the 2nd rigs went nowhere, except down the mine. The most spectacular mine should go to Gizmo. Loaded up downhill they found a mine and drove straight into it, sending the crew flying around the forestay. The boat hung in the perfect vertical pose, until the pole snapped, releasing the pressure and catapulting the hull into the floating skipper, gunwale straight into his head. Five stiches later, James Birdsall has made a full recovery. Despite the trail of blood, Adam Forbes on Maersk, whose pole was also in pieces due to a similar mine, claims that his mine was better. Breakages also played a prominent role. Nick and Noddy in Sydney Sailmakers revel in these conditions and took their 3rd win from 3 starts. Geotherm placed second and a charging Peter Polec in Skoll charged into 3rd. There were 8 DNFs proving that angry Nor-Easters still turn up, just sometimes a little late. This entry was posted in News on November 28, 2017 by Skiff-Ed.